Daily Prompt: Colours: The Bluest Time of the Year. Most people in the Northern Hemisphere would agree; this is the bluest time of the year. But at least the worst is over, we’re through the thickest part of the gloom-filled hump. It’s staying lighter longer and the sun is making it a little higher everyday. For a few weeks everything seemed to be in black and white with a whole lot of grey. The sun would try to slowly creep in too late in the morning, hide its face behind a row of cedars then sink again, too weak to reach the tops. When the darkness was starting late afternoon, Christmas decorations and a Christmas tree helped tremendously. I still feel like a child in wonder when I light up the evening with the tree; it glows and sparkles with crimson red, emerald green and silvery white balls. Icicles catch the lights and play with all the colours. Its merry and bright; the lights and colours seem to laugh, giggle and sing twinkly little songs. After New Year’s they get tired. Their garish display is getting old like a fading Hollywood star. I hear a faint carol from the red and green balls as I lay them in their beds for another year. By now the early morning darkness turns to pink and the snow takes on a violet hue. A fiery orange globe starts burning through the leafless trees then turns to a bright yellow; the sides of Paper Birch light up, calling back the same tones. But my very favourite colour of this wintry season is the colour of the snow at twilight; just after the sun has gone down but it’s not quite dark, the snow is bright indigo. 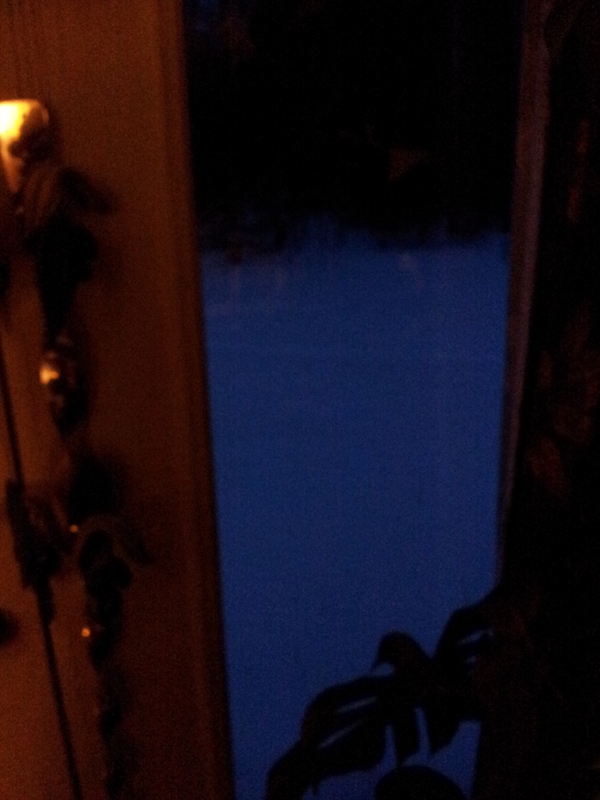 Its electric blue and glows as if there is a great light underground. It’s the most beautiful colour of all, it vibrates; my eyes drink in the beauty of it. I understand completely why so many people don’t want to stick out winter in Canada if they don’t have to. But for all the gloom and hardship, I would miss the changing of the seasons. Without this, spring would not be so anticipated. I think I would tire of a garden that always needed work. I like it hidden away and forgotten then watch it slowly return as the snow melts away. Each season has it’s own beauty and colours. What a beautiful world we live in.